A parade of nine jugglers crosses the stage. Formally dressed, upright, in all cases coiffed, they juggle red apples, smile in turn, and slow-step to a line of nine chairs. As they take their seats, the sequence of their work is intersected by new patterns, of expression or gesture, that cycle and repeat through the group: covered eyes, two apples held coyly (or in surprise) to the chest, the smile. The soundtrack is music hall. The stage is set with crockery—china cups and old teapots and milk jugs—the cast arranged in the spaces between. A deadpan and charismatic Sakari Männistö, enjoying the cynicism of his own actions like a Rushmore Bill Murray, moves between the working jugglers to disrupt them one-by-one, waving a roll of newspaper in front of their faces, between their legs, amid their hands—never swatting the apples away, but harrying nerves and concentration, like the game of trying to make another person blink. He keeps at it until they drop. Smashed! was made as the centrepiece of a Gandini Juggling residency at this year's Watch This Space. I saw the company at WTS last year as well, where in the matter of a week they turned out probably my favourite piece of outdoor theatre that year, Gandini NightClubs, an abstract and technically complex ensemble show which collected a group of markedly different performers and joined them by their unabashed love of spreadsheet juggling and mathematics. In some respects NightClubs and Smashed! lie far apart, but they are, I think, alike in an attitude of dissidence, or a quality of subversion, which in NightClubs came from the technical language, and which in Smashed!, the wryer of the two, appears in wisps of narrative, with straight characters pursuing actions past the point of will, pleasure, or sense. So in a very funny closing scene the tall, lugubrious Malte Steinmetz struggles, staggers almost, eating an apple as he juggles it—an old trick, here chased on to an absurd end, bite following bite faster than a man can swallow. There's a feeling that the piece delights in its perversity: the touch I remember best is the song about a man hankering after bananas which plays while the cast juggles dozens of apples. Smashed! played at the National Theatre's Watch This Space festival 15-18 July 2010. It's nine performers were: Sean Gandini, Kim Huynh, Sakari Männistö, Owen Reynolds, Inaki Sastre, Niels Seidel, Malte Steinmetz, Jon Udry and Kati Yla-Hokkala. Sean Gandini was interviewed 29 July in the calm, cool interior of Yauatcha on Broadwick Street (they do blue tea; recommended). 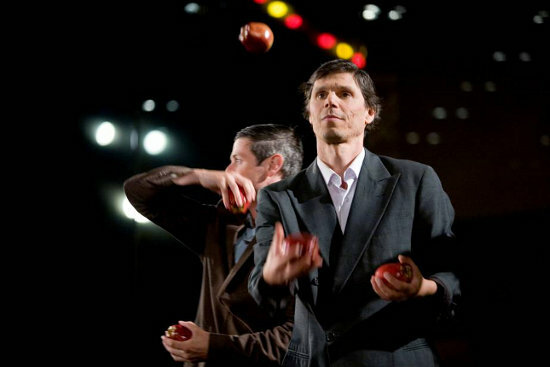 At present Gandini Juggling are working with director Maksim Komaro on a show that goes back to basics – finding what's simple and beautiful in juggling. Also, four Gandini regulars, Toby Walker, Jorge Silvestre Granda, Guy Waerenburgh and Tedros Grimaye, recently joined Cirque du Soleil for one of their embedded casino strip shows, Zaia. To follow the company's wide-ranging activities turn your eye to the Gandini blog. For more on Gandini Juggling see John Ellingsworth's review of Blotched in Issue 1 of Sideshow Magazine.